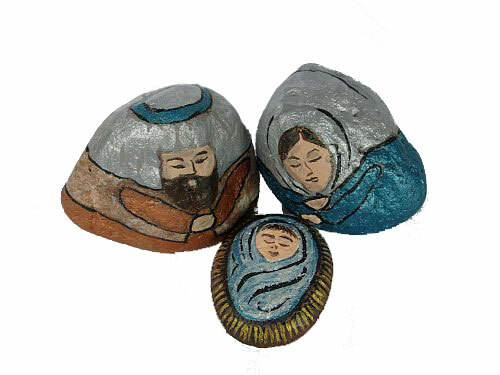 The nativity scene figures in this small set were painted with metallic acrylic colors. Mary's robes are metallic topaz; her head scarf is metallic silver. Joseph's robe is painted with metallic copper; the unpainted natural rock is used for his vest; the headdress is silver metallic and his head band is metallic topaz. Jesus' swaddling clothes are metallic topaz and metallic silver.